Every morning, the fine folks at Sports Radio Interviews sift through the a.m. drive-time chatter to bring you the best interviews with coaches, players, and personalities across the sports landscape. Today: potential Vikings starter Tarvaris Jackson. 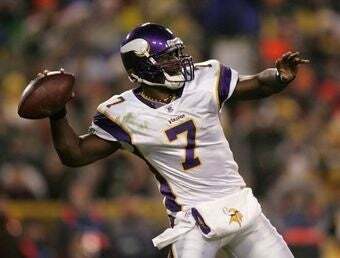 Tarvaris Jackson is entering his fifth year with the Vikings and still has no idea whether or not he's going to be their starting QB this season (reasons for this are somewhat unclear). Jackson sat down with KFAN in Minneapolis to discuss this Favre person and how exciting it would be to the the starting QB on this team. "I am on the field just playing, trying to get better, but when I get off the field I have to deal with it and answer questions from the media from it. Every time I turn a different channel on the TV I have got to answer questions, I have got to watch it on TV. It is a difficult situation but I just try to block it out and just try to keep pushing." "I am a different player. I feel like I have grown up a lot, I know I have grown a lot since then. I feel like whenever I get my chance to go out there and play, I will prove it. It is easy for me to say it, I just got to go out there and show everyone because I understand the situation with everyone don't think I can't do it or people don't think I can't but it don't really bother me a lot. As long as my teammates believe in me, I believe in myself, that is the big thing. If I believe in myself and stay confident and even keel like I am, I will be fine." "Definitely. We have grown a lot as an offense and as a team since then. A lot of our guys, this is going to be coach's 5th year here. Most of our core guys have been here for at least 2 or 3 years now and like you said, Sid has gotten a lot better since that year, Bernard, and then we have Percy. Adrian is a year older. I feel like our offense has grown and we have just grown as a team. Our offense is together now and I feel like if I get a chance to go out there and play now, I feel like I would be a lot better." "It is very exciting knowing that we have a team to get there even though a couple of years back, even when I was starting back in '07 and '08, we felt like we was a Super Bowl team but we have gotten a lot better since then. It is very exciting knowing that the type of team that we have and that is what pushes me every day to try to get better so I can help lead my team to that point to win the Super Bowl. That is the thing about it is just not going in there and playing well to show people that I can do it. It is more about the team than it is about me."